There is a vast array of services being deployed in Canada and elsewhere. Many of you may be using Apple Pay or Google Wallet. You may also be getting investment advice from “robo advisors.” There is peer-to-peer lending, such as the Lending Club, and even more services are in the works. I have had the opportunity to participate in a number of fascinating discussions about fintech in recent months—with my colleagues at the Financial Stability Board and other international organizations, as well as with fintech entrepreneurs and traditional financial institutions around the world. I can tell you that, despite the hype, no one knows yet what the social and economic payoff of these investments will be. And because it is early days, no one knows for sure what fintech developments will ultimately mean for business models or for the financial system more generally. But we are all trying to figure it out. I know this interest extends to all of us in the payments business, which is undergoing its own transformation. This conference is a great setting to offer a central banker’s perspective on fintech. So I want to thank Payments Canada for the invitation to speak here today. The Bank of Canada is doing a lot of work in this area. Today I will explore three points with you that frame our thinking on the issues. First, fintech has the potential to transform the financial system across a broad range of services. And that is a good thing, because there is a lot of inefficiency that can be shed. Second, although some of the technology may be revolutionary, its overall effect on the financial system is likely to be evolutionary. Financial institutions that adapt will survive, and new service providers will become part of the financial ecosystem. In some areas, this evolution is happening fast, while in others, the most transformative technologies still have developmental hurdles to clear. Finally, now is the time for financial institutions, new entrants and policy-makers to work together. That is the best way to create the right environment for modernizing the financial sector and sensibly managing the risks that arise. This applies to many areas. For the Bank, the focus is on preserving financial stability and maintaining the safe and sound operation of core payment systems in Canada. My first point is that change is definitely in the air. In many cases, financial innovations are simply interesting twists on existing technologies and business models. They promise to lower costs, improve services and broaden access. Peer-to-peer lending is one example. As we have already seen with the taxi and hotel industries, peer-to-peer services challenge traditional intermediaries. This new competition could fundamentally change the relationship that traditional financial institutions have with their customers. From a regulatory perspective, the main issues relate to consumer protection, market integrity and rules that guard against money laundering and terrorism financing. Authorities are working to close significant gaps in these areas and are monitoring implications for financial stability. Then we have financial services enabled by fundamentally new technology. A prime example is distributed ledger technology (DLT). This technology has the potential to replace entire transaction systems, including core payment systems, and offer new products, such as smart contracts. Smart contracts are agreements written in computer code that do not need human intervention to be executed. This strand of fintech could take us into uncharted territory. As I will explain in a minute, regulators could face issues related to governance, legal environments and financial stability. I see a combination of factors that point to the potential for greater change this time. First, customers are more demanding than in the past. They are looking for more convenient and cheaper access to financial services that are well integrated with the rest of their online activities. Customers expect these services to be personalized, and faster, in part because of the widespread use of smartphones and the speed with which new apps can be pushed out.5 Given how accustomed people have become to instant access to goods and services, it is no surprise that they expect instant access to their money. That is why we see a push to implement real-time retail payment systems in nearly all major jurisdictions.6 This will be an important point to consider for the modernization of the Canadian payments system. Second, we are seeing large, well-funded companies outside the financial space, such as Apple and Google, starting to offer financial services. One of the main advantages of traditional financial institutions is the trust they have built with their customers. Tech giants also have wide customer bases and brand loyalty that could help drive adoption. These companies are using their customers’ information and their existing platforms to offer attractive and cost-competitive services and to pick away at the most profitable business lines of financial institutions. The range of services they offer could grow over time. Finally, some existing financial institutions and infrastructures have become relatively inefficient, while new technology has reduced barriers to entry in this space. Supporting systems can date back several decades and are often not interoperable, even within an institution. So the door for competition is open. This brings me to my second point, which is about the kind of change we can expect. Traditional players will have to adapt to survive, and there will be new players. And the new technologies that could be truly transformative have some way to go before they are ready for prime time. So I expect we are in for more of an evolution than a revolution. It makes me wonder what people will say about distributed ledgers 100 years from now. Let us first remind ourselves what this technology brings to the table. The exact features of DLT vary, depending on the needs it fulfills. At its core, it is a computer protocol that allows many participants to record information on a single ledger that is shared among users, so each one sees the same data. A consensus mechanism and modern cryptography ensure that stakeholders agree that entries to the ledger are authentic. The ledger’s key benefit is that you do not need a trusted third party to guard against double-spending or expensive processes to reconcile information between ledgers. The best-known application of DLT is Bitcoin, which is a decentralized digital currency. The ledgers used for these currencies are “permissionless,” which means that anyone with a computer can download the software, see the ledger and start authorizing transactions. The decentralized aspect of the technology is why some predict that widespread application of DLT could revolutionize entire industries. They contemplate alternative futures, such as one in which there is complete disintermediation of banks and even central banks, with state currencies being replaced by decentralized digital currencies. One interesting application is in the syndicated loan market, where loans can take up to 20 days to go through the clearing and settlement process. DLT could reduce this to about seven days by providing a secure database that all participants share across a distributed private network.10 Looking at a single source of information would help reduce disagreements and make it easier to comply with legal requirements, speeding up the process at every stage. We may also see applications in areas such as trade finance and supply chains, where information cuts across jurisdictions and is difficult to centralize. One estimate suggests DLT could enable banks to save as much as $20 billion a year in global back-office costs if applied to cross-border payments, securities trading and regulatory compliance.11 So it is easy to see why private enterprise is investing a lot of money in this type of technology. If these ventures deliver on their promises, improvements could extend beyond efficiency and cheaper processing. Transactions could be settled almost immediately, which would reduce counterparty risk and free up capital for other uses. Transparency would be enhanced because a distributed ledger lets participants see the entire history of transactions. That said, several important issues with DLT must be resolved before its benefits can be realized. First on the list are technical issues related to scalability, the consensus mechanism, data privacy and cyber security. Second, proponents will have to agree on governance, which can be a challenge when stakeholders have divergent interests. Bitcoin’s recent struggles are a clear illustration of this.12 Finally, standards and protocols, as well as a solid legal foundation, must be established to allow for interoperability. Protocols may be an area where governments can contribute. In the early days of the Internet, governments helped develop the first networking protocols. Like the Internet, many of the applications of DLT will require a global view. The final hurdle DLT has to overcome is to gain regulatory acceptance and comply with domestic and cross-border laws and regulations. Authorities should support innovation, but the bar will be high, especially for core financial services, and appropriately so. Financial institutions, including Canadian banks, are working hard to test and adopt new technologies and adjust to new trends. So while banks may look different in the future, they will still play a major role in the financial system. Voice over IP: here was a revolutionary advancement in technology that caused an evolutionary change in how we, as end-users, use the phone system. This brings me to my final point. Now is the time for financial institutions, new entrants and policy-makers to work together. The opportunity cost of sitting back and waiting for the dust to settle is too great. Financial institutions and infrastructure operators are making important strategic decisions about which parts of their businesses they want to defend and grow and which ones they want to scale back. This urgency is not only coming from fintech contenders. Banks are also dealing with a more demanding regulatory environment and exceptionally low interest rates around the world that are squeezing profit margins. Banks already spend close to $200 billion a year on IT globally, so replacing legacy systems will mean difficult and critical investment decisions. For the Bank of Canada, our priority is to see upgrades made to the core payment systems that the financial system relies on and that the Bank oversees: the Large Value Transfer System (LVTS) and the Automated Clearing Settlement System (ACSS). These systems have served us well, but both require investments that are needed to fully meet our oversight requirements. Investment will also help the systems better meet the modern needs of participants and their customers. Take the ACSS, for example, which still handles most retail transactions today. It was implemented over 30 years ago, when everyone wanted a Commodore 64. The ACSS may have been at the forefront in 1984, but we are far from the efficient frontier now.14 Cheques take up to four days to clear, and some information needs to be re-entered manually. Now is the time to make our core systems more efficient and competitive. For consumers and business users, we need to move closer to real-time access to funds. In both the ACSS and LVTS, we need to collect richer data on transactions and, ideally, make them interoperable to avoid having to manually re-enter information. This effort is not change for change’s sake. If we can leverage some of the existing infrastructure and still achieve our goals, that is all the better. For our part, policy-makers and regulators need to address innovation in financial services in a few proactive ways. The first is to develop a solid analytical framework to understand and assess the benefits and challenges of something so new. This is something the Financial Stability Board is working on. Authorities will make their assessments through many lenses, including consumer protection, financial inclusion, market integrity, competition policy and financial stability. That is why other international groups such as the Committee on Payments and Market Infrastructures, the Basel Committee on Banking Supervision, and the International Organization of Securities Commissions are also involved. The Bank of Canada, together with our domestic colleagues, is actively contributing to these efforts. Since fintech is a global phenomenon, it is critical that this regulatory effort be global. We must also learn from emerging-market economies that are further along in some areas. While fintech innovations promise to solve some current problems, they could also create new ones. Let me give you an example: I worry that network effects, which underpin the success of many payment applications, could lead to an excessive concentration of payment service providers. If this happens, households and businesses may not benefit from cost savings. This is clearly an issue for competition authorities. I also wonder how DLT-based infrastructures could affect the financial ecosystem. Ever-increasing automation through, say, smart contracts, could increase efficiency and certainty but could also increase financial volatility. Would that volatility be short-term, such as flash crashes? Or would it entail procyclical dynamics or new channels of contagion? There are also questions about whether the regulatory perimeter is adequate, given new entrants and risks of regulatory arbitrage. In my view, the field of inquiry should include the inherent risk and systemic importance of an activity, regardless of what entity is performing it. Even as we strive to implement a regulatory response that is proportionate to the risk, we need to keep in mind that maintaining a level playing field is important. Some of these issues are not too different from those that authorities face in their work on shadow banking, another area where new entrants are challenging traditional players.16 And, big or small, operational risk deserves much greater attention. The second way to address innovation in financial services is active engagement between authorities and the private sector. Some countries, such as the United Kingdom, Australia and Singapore, have created official regulatory “sandboxes.”17 These sandboxes allow start-ups to experiment with services without jumping through all the usual regulatory hoops. Here in Canada, we are consulting with fintech entrepreneurs. The Bank of Canada is also partnering with Payments Canada, Canadian banks and R3—which leads a consortium of financial institutions—to test drive distributed ledgers. Our only goal at this stage is to understand the mechanics, limits and possibilities of this technology. The plan is to build a rudimentary wholesale payment system to run experiments in a lab environment. Our experiment includes a simulated settlement asset used as a medium of exchange within the system. It is very much like the settlement balances in LVTS, except it is using DLT. Because it cannot be used anywhere else, it is a different animal altogether from a digital currency for widespread use. This is an experiment in the true sense of the word. I cannot think of a better way to understand this technology than to work with it. Other frameworks need to be investigated, and there are many hurdles that need to be cleared before such a system would ever be ready for prime time. e-money.19 We are continuing this work and broadening it to include other developments, such as peer-to-peer lending and uses of DLT. We also want to understand how new financial technologies will address the underlying forces that created the need for financial intermediation in the first place. In theory, new technology could enable a different framework for addressing the same frictions, potentially one that does not require financial intermediaries at all. The names and faces may change, but I do not see technology changing the need for maturity transformation, loan monitoring, intermediation of borrowers and lenders, and trust. This is a good question for academics. Let me wrap up. While it is important to filter out the hype surrounding fintech, I am convinced that it could have a net positive impact on the financial system, provided the risks are adequately managed. Fintech will likely entail more of an evolution than a revolution. This is because incumbent financial institutions will adapt, new players will join the financial ecosystem and those with strong business models will survive. And the most fundamentally transformative technology so far—DLT—still has important hurdles to clear. Innovations may solve some current problems, but they could also create new ones. The regulatory framework needs to adapt so that the door is not opened to unmanaged financial and operational risks, unchecked critical dependencies within our financial system and moral hazard. Promoting financial stability is a core function of the Bank of Canada, and we take a system-wide perspective when we monitor risks. There is a lot of hard work ahead, and we need to get on with it. By working together, we can unlock the full promise of fintech to ensure a smooth evolution to tomorrow’s financial system—safe, sound and serving the people who rely on it. I would like to thank Scott Hendry, Grahame Johnson, Ron Morrow and Stephen Murchison for their help in preparing this speech. 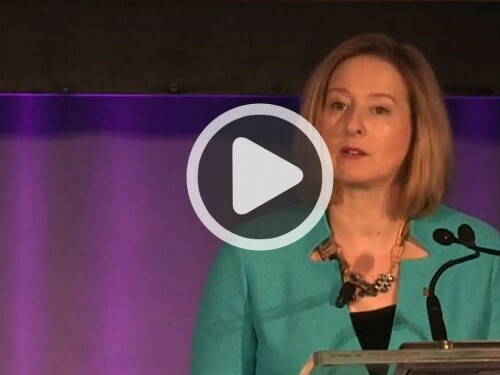 Technological innovation in financial services could transform the financial system, Bank of Canada Senior Deputy Governor Carolyn Wilkins said today. But realizing the benefits of fintech, while guarding against the risks it could create, requires strong collaboration among actors in the financial system.